Rederiving murine research models is the process of transferring embryos from one animal into another which is either germ-free or hosts only specifically identified microbiota. This "resets" the health status of the line, allowing the offspring of mice or rats that were previously infected with either viruses, parasites, or bacteria to be used in research studies. Health designations for mouse lines can be grouped into gnotobiotic or specific pathogen-free. Gnotobiotic (from the Greek roots gnotos for "known" and bios for "life") is a health status in which all forms of life present within a given organism are known. Mice that are rederived at this health status have either no pathogens and are referred to as germ-free; or they have specific, defined flora. Cohorts of mice at either of these health designations must be maintained in isolators and all materials transferred into the cages must be sterilized. Animal care technicians can only access the mice through glove boxes, and when the animals are shipped to the client, they must travel in specialized cages to prevent pathogenic contamination. 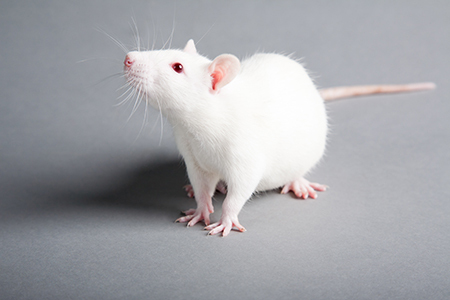 Germ-free mice are vital research tools for studying the physiological response to a treatment in an animal lacking any commensal bacteria. Recent studies have shown relationships between the efficacy of disease treatment and composition of bacteria in the gut microbiome. Generating a mouse model lacking all commensal species of bacteria may therefore provide insight into mechanisms which contribute to the progression of these conditions1,2. The specific pathogen-free (SPF) classification refers to a cohort of animals that do not contain specific pre-defined bacteria, viruses, and pathogens. However, this does not guarantee a defined composition of harmless bacteria may still live in the gut or on the surface of the animal3. Animal health reports released with cohorts of SPF mice will contain test results for the presence of specific bacteria, viruses, and parasites. While the SPF health status does not guarantee that the animals lack pathogens that were not tested for, they are easier to house in barriers and do not require the specialized isolators used for gnotobiotic animals. The most common technique for mouse line rederivation is embryo transfer4. To start a rederivation project, both males and females are needed from the customer to generate an embryo with the desired phenotype and genetic modifications. The mice must be brought to a facility that can accept mice of a lower health status than the ones currently located in the barrier. These mice are either accepted into a separate room in a facility or placed into individual isolators that prevent the spread of pathogens. Once embryos are generated (up to the eight-cell stage) they are removed from the uterus of the donor mother and aseptically-washed to remove any potential contaminants. The embryos are then transplanted into pseudopregnant females of the desired health status and allowed to grow to term5. The gestation process lasts for three weeks, after which the offspring are weaned and grown to sexual maturity for breeding larger cohorts of mice. 1. Matson, V. et al. The commensal microbiome is associated with anti-PD-1 efficacy in metastatic melanoma patients. Science 359, 104-108 (2018). 2. Lindenbaum, J., Rund, D. G., Butler, V. P., Tse-Eng, D. & Ranjan Saha, J. Inactivation of digoxin by the gut flora: reversal by antibiotic therapy. New England Journal of Medicine 305, 789-794 (1981). 3. Harris, R. J. C. Establishment and operation of S.P.F. colonies. Problems of laboratory animal disease 249-259 (Academic Press, 1962). 4. Reetz, I. C., Wullenweber-Schmidt, M., Kraft, V. & Hedrich, H. J. Rederivation of inbred strains of mice by means of embryo transfer. Lab. Anim. Sci. 38, 696-701 (1988). 5. Robinson, V. et al. Refinement and reduction in production of genetically modified mice. Lab. Anim. 37, 1-51 (2003).